Put A Little Umbrella In Your Drink: Great #Gift Idea :: Progressive Alarm Clocks :: Hard Time Waking Up? These Are Perfect! Great #Gift Idea :: Progressive Alarm Clocks :: Hard Time Waking Up? These Are Perfect! Gilt has an Alarm Clock on Wheels known as Clocky on sale for $25 starting today! Clocky runs away and hides if you don't get out of bed. When the alarm sounds, Clocky will wait for you to get up. But if you snooze, Clocky will jump off of your nightstand (from 3 feet) and run around your room, determined to get you up on time. Clocky is hip, innovative and charming. What could be better to wake up next to? 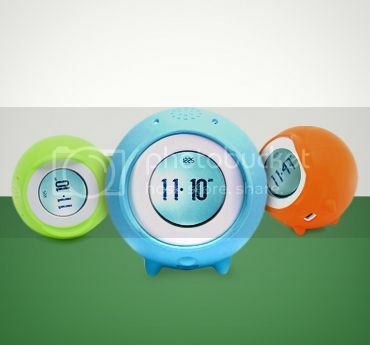 Another option is this guy - an alarm clock that runs around - if you snooze, Tocky will jump off of your nightstand and run around, determined to get you out of bed.Tocky is outfitted with a built-in microphone, you can record personal wake-up messages. In addition, Tocky can upload MP3s. Wake up to your favorite tracksrolling around your room. Tocky is on sale for just $40. These clocks are available at Gilt. All you need to do is sign up to unlock these and other great deals.